I have the gift of remembering every single regretful moment in my life. Any time I’ve publicly humiliated myself, it’s impossible for me to forget that feeling of embarrassment. In my photo-narrative, a boy tries to put his past behind him. While he is on the swings, he sees flashbacks of a previous relationship that ended badly. When he jumps off, it symbolizes his trying to forget the past. In the last frame, it shows him looking behind him at the girl from his past sitting on the swing. My photo-narrative represents moving forward but at the same time, not forgetting the past. I still remember the time when my first grade class went to Chinatown and I barfed in a fountain after eating a lunch of fake Chinese food. Before, embarrassing memories used to make me blush, but I’ve learned to laugh about it and am now sharing it with the rest of Freestyle Academy. Hopefully, through my photo-narrative, more people won't continue to dwell on their unpleasant memories and instead, think of them as part of who they are. Special thanks to David and Julie for being such great models!! For the story based on this photonarrative, click here. It was my middle school French teacher who taught me the art of spacing out. She meant to teach basic level French, which I did end up learning, but at the same time, her class trained me to fall into a perfect daydream. I've taken my habit of daydreaming to other classes and to obnoxious dinner parties. Whenever I feel the need to escape boredom, I drift off to a more pleasant place in my mind. My narrative illustration is based on an English assignment in which I wrote about my habit of zoning out. 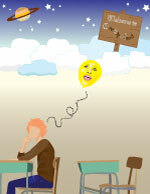 In my illustration, a faceless girl sits in a desk while her face (and her mind) drifts off to a more interesting place. I made her faceless to show how although physically, she is in class, mentally, she is floating away like a balloon. Through this illustration, I hope people can relate to my usual feeling of drifting off to a different world.